Being in a Mini transported me back to the 70s, but this new model is bigger, better and a whole lot more expensive, says Matthew Gwyther. The first member of my teenage peer group to acquire four wheels had the 70s version of this car. (He also had the Kate Bush-in-a-leotard poster Blu-Tacked to the ceiling above his bed.) My god he was popular as we'd pile into the back of his used £500 brown Mini and he'd whizz us all off to parties where we'd get stuck into the Twiglets and the Long Life, while he'd be responsibly sipping on a Coke. Party on, Wayne. It all ended in grief on one fateful journey with three of us cavorting in the back when the rusty sub-frame snapped. I can still recall the sickening downward jolt. Cost him £400 in welding to fix, when £400 was a lot of money. He later bought a Renault Fuego. I digress towards nostalgia because this is what this vehicle is all about - heritage. Mini has done terrifically well for BMW since it was taken over in the mid-90s. Standard Minis are fun but small. 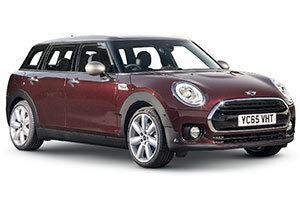 The Clubman is the largest version yet with six doors and four windscreen wipers. There is precious little pure design logic in the pair of sideways-opening boot doors. But in an automotive world short on quirks, Mini is about very clever packaging and BMW has got the brand properly sussed. For a small car, it feels extremely solid and tightly locked together. It whizzes about, but the six-speed gearbox is a bit notchy and I kept hitting the accelerator with my right foot when using the brake. It sits very low to the ground indeed and the dark cabin with its huge, glowing circular centre console, similar to a dinner plate, feels more like a cockpit. You can choose a dynamic driving style, which it says is akin to go-karting. Once you take out the false floor in the boot you have a fairly serviceable family car, providing your kids are at primary school. However any sense that it's up there with a Golf or Focus when it comes to lugging stuff about is fanciful. Once all the added extras are included, the on-the-road price of our model came to an eye-watering £30,160, which is little short of bonkers bearing in mind you can get a BMW 320 Touring for £1,000 less than that. According to my colleagues on Classic & Sports Car, my mate's original Mini would have cost about £834 new. The Kate Bush poster about 39p.